Antiques experts Paul Laidlaw and Margie Cooper are on the second leg of their road trip. After a disheartening first auction, Margie has a lot of catching up to do. around the rugged Cornish rocks. Look at the views, look at the views! -What's that rock over there? Margie Cooper and auctioneer Paul Laidlaw. What a remote corner of the country! You do feel a bit distant from the hustle and bustle and that. Unfortunately, they were a bit chilled in that auction as well. but Margie's posh tools were a particular disappointment. How much loss is that? That's just a lot. I think we'll just call it a lot! It's a rich vein this and I'm obliged to mine it till it's exhausted! While Paul's managed a modest increase of £18.46p. So, not a lot to boast about, either of you. Between us, what have we got? -That'll buy us two surf boards! Hang on, we want money makers, not beach bums. at St Buryan and heads both north and east. before arriving at Newent, in Gloucestershire. and ending up at an auction on the Devon coast at Seaton. Around here, it's all about the bridges. the town was just called Wade, it then became Wadebridge. You don't say bargains in this business, you say good buys! built for the TV series Challenge Anneka. -Hi, Mike, how are you doing? I'm Paul. Good to see you. There are three very full floors at Victoria Antiques. furniture that will surely be out of their bracket. ..Paul's as rigorous as ever but Margie's wandered off-piste. It seems the dealer's son, Carl, has a backgammon set for sale. -Yeah, yeah, it's got all the doubling dice. -Probably not old, it's probably about 1970s, '80s. Why bother with antiques when you can't make money at auction? Well, that's right. You can have it for £15. Couldn't do ten, though? That would be a real insult. -I withdraw that comment, immediately. a bit of a letdown at the last auction, Margie. It's a good size, that's the thing with it, it's the size that matters. Yeah, size isn't everything, though, is it? Meanwhile, Paul's found something very familiar. The ticket price on that card tray is £55. Just slacken the price of that one, testing the water. It's getting in the right direction. dress seal that he acquired earlier on the trip. This is going to sound so wrong, she's cheap! Yeah...but Paul seems equally enthused. Second time around, then! A nice piece of full period, Art Nouveau metal work here. That could sit in your hallway for visiting cards or whatever. I like that fact that you've got quality modelling here. Look at the visage on this lady here. she is holding this oversized tray in a provocative stance. Mike's telling me that it could be£30. Now, there is one fault, you've just got a wee crack there. but it may help me get the price down a wee bit more. Ah, Margie's made a bit of a find now too. Wow! A collection of elephants. Otherwise, we don't want to go anywhere near them! with his trunk up - it's lucky. I've got one in my bedroom. It's not bringing me much luck yesterday, did it? Oh, very nice, Margie, but they're not for sale! rooting about in his private collection. I'm sorry, that's rude. I shall be annoyed if someone did this to me. -Occasionally, I do sell them when people ask. How much are the bigger ones like him? He's a nice one. -He's a nice one, isn't he? I believe 45 for that one and he's worth every penny. You need an elephant that's got a purpose really. but I need to get 45 for them and that is it. He's lost his tusks, bless him. although he's got his... his little toes are all right. and then we've got to take off the commission. I just don't think I'm going to make it, do you? this is the bargain of the day, £35. They're just delightful, aren't they? -OK, you've got yourself a deal. areas, Paul's after a bit of walnut. Nice piece of woodcarving, that, isn't it? Nice, substantial piece. It's a Victorian piece, late 18th century. But who wants such a thing? No-one's got a butler any more. Erm, £30, not a lot of money. It's good work, it's good work. I think I'll find Mike and see what we can do here. At least it's not part of his private collection, ha! Another well spotted...bargain, erm, £30 on it, you can have it for 20. -That's in at 20. What was the lady, 30 or 35? Would you give me a deal on the two? That's got to be 50, hasn't it? Does it have to be 50? I'd rather it was a wee bit less than 50. -That's why you've got a deal. Good. -You've got some profit there. -All right, I hope so! Another lightning raid there, Paul, but what about Margie? Just looking at this silk-work picture. It's quite nice. The amount of work that's gone into that! It's probably early 19th century. Maybe earlier probably earlier, 18th century. Look at the work that's been done here. Look at the window...look at that! It's beautiful! Very attractive but it's just been messed up in this awful frame. If you were a wealthy lady, what did you do all day? You had the life where you executed stuff like this. From someone who can't sew a button on, I just think that's amazing! £48...think it's worth asking him if it's any cheaper. Look out, Mike, Margie's on a mission! This is something that's just taken my eye. -It needs a lot of work, doesn't it? You've got to buy it for that! I reckon there's got to be a profit in that. when I get devastated at the auction. -Yeah, but it's a good content. -So, how much was the other piece you bought for? -If I said 55 for the two, there you go. You're a wonderful man, Michael. -I'll come and see you again. ..in an effort to make a profit. Oh...she's certainly trying her best. Now, where's Paul got to? Seems our military buff has spotted a shop called The Bunker. Good to see you, Bob. so most of Bob's stock is still boxed up. That won't discourage Paul, though. and they open fire on it, basically. Man alive, what an interesting thing! It's a precision piece of engineering, that, isn't it? Would you sell it or not? Erm, I'd have to think about it. How much is that missile in the window? Thankfully for Seaton, it doesn't seem to be for sale. has travelled south from Wadebridge to St Columb Major. the ancient game of hurling through the streets of St Columb. and all hell breaking loose! "Town and country, do your best". Go on, Margie, you do your best. Oh, no, not another elephant! Ah, yeah, part Brothers Grimm and part Lewis Carroll. and just right for our silver specialist. -Look at her, oh, what a little cutie! -I can't find who she is! -With a little petal hat. She's slightly spooky, isn't she? -Yes, she is a bit. -Yeah, little face peeping out. Looks like a Cornish Piskie, I'd say. I don't think I've ever had a money box. Now, why doesn't that surprise me?! It's a silver belt buckle. I suppose you were bought this when you passed your exams and qualified. So, it's quite old, yeah. -It's 1901 or '02. How much have you got on it? -I've got 89 on it. Yeah...she'd wear it on her belt buckle. unless you want to be extremely generous. Ah, well, at least they're enjoying themselves! Early patent Eugen Sandow dumbbells. -He was Mr Universe or whatever. He was, he was the father of modern bodybuilding. as well as several devices like these. Sandow even coined the term bodybuilding. I don't think they're very attractive, six-packs, do you? -It's men who want six-packs but we don't. I'd rather have a nice smile. -I like a nice smile, that's what we want. I think muscles are overrated. you might think about buying something. How about another look at that buckle, eh? Paul did all right with one at the last auction. I've never seen a heart-shaped one. She would have been so thrilled to receive that, wouldn't she? -When she became...then an SRN, it would be, wouldn't it? Meaning either State Enrolled or State Registered Nurse. otherwise I'd love to buy it. Oh, yes, I think her heart's set on it. she can only afford about half of that ticket price, though. Is 38 going to buy it? Get the money, get it into new stock. It would be nice to turn it around into something else, wouldn't it? It's just a lovely tactile piece of silver. Oh, come on! 40 sounds better for you, 38 sounds better for me. Go on, Janet, I'll have it. I'm not going to argue with you. That £40 leaves Margie with just £43.56p left to spend. But what about Paul, alone in the Alfa? ..to visit a ruined castle of Arthurian legend. Wow! Do you think I'll ever find a more dramatic parking place? -Hi, Paul, pleased to meet you. Man alive, that is a view! but there's a few steps. -I'll come and show you. and this romantic spot is where it all starts. Everyone in Cornwall loves Arthur. The Cornish people and the Celts have taken Arthur really to heart. You know, it's a great legend! And if a legend can't be born here, where can it be born?! in which he claimed King Arthur was conceived at Tintagel. this is the courtyard of the old medieval castle. who was Henry II's half brother. and this big, great hall to make himself look more powerful. but this was kind of his holiday cottage. and then he'd spend a couple of weeks down here but the seaside. Tintagel's association with The Once and Future King just got stronger. fitting for their time and history. and so now we get up to 190,000 visitors a year. when he pronounced that this was Merlin's Cave. and he took him through the cave and whisked him away. -It does have a magical feel to it, doesn't it? And maybe some of that magic will rub off on you! Is the tide coming in or going out, Mike? Well, it's supposed to be going out but I think the waves are coming in. Maybe we should start to leave. Come on! several hundred years before the castle was ever built. and the guys who lived here were trading with those. bringing these big amphoras filled with olive oils and spices. there's maybe a thousand people living up here. So, arguably, the 6th, 7th century is its real historic heyday. And that's the Arthur period. So, was Arthur really here? inscribed with the name Arthnoo. It's evident that the name Arthur or Artus was being used back then. and he was born at Tintagel, it kind of fits in. It does! It is astonishing! Ah, well, back to our own particular Holy Grail. Is it possible, Paul, to lose all your money? That's certainly one way of becoming a legend, Margie. Next morning there seems to be an issue with the brakes. How brave are you feeling this morning? I would be understating the case. What are we going to do, Paul? We've got the whole day to finish! -Can I jump on, then? to say this can't be done on foot, I suppose. and a silver plated card tray. a silk-work picture and a pair of elephant book-ends, as you do. Yeah, that lot cost £95. This leaves her with just over £40. She'll have to be canny with that today. but our next stop is Boscastle. Come on, Margie, we don't have all day, girl. Buck up! with his first wife here back in 1870.
more about the ancient practice of witchcraft. -It is. It's a lovely, very magical place here. and from Mother Earth to mandrakes. and is said to be the largest of its kind in the world. so are the roots in witchcraft? Is that where I got my superstition? -important part of people's daily lives. I mean, people still put horse shoes on their doors. They still send good luck cards with pictures of black cats on. traditional folk magic was demonised. powers came to be seen as a threat to society. What's a white witch then? but it was still frowned upon. because, essentially, it was quite subversive. and, in particular, power to women. This idea was society turned upside down. hundreds of women of sorcery and making a covenant with the devil. at least three quarters were women. dating from the time of the witch-hunts. This was written in 1681. One of the particularly interesting pictures is this one. -He looks like a minister. He does, doesn't he? He doesn't look very devilish at all really. the stereotypical image of how you put a curse on somebody. this natural energy which is what people who practise magic saw it as. That the devil is actually giving the magical power to the witches. and especially superstition, are still very much part of our lives. So, I recognise the famous witch ball. shiny things to reflect away bad luck. Things like horse brasses belong to a similar tradition. there was very much a superstition that you shouldn't sell them. One good luck charm that is for sale is this little chap. This is actually one from the First World War. It's called a thumbs up doll. and family to soldiers who were heading off to the war. But his...his hands are held with the thumbs up gesture. soldiers were going off into deadly peril. the practice of tasseography or the reading of tea leaves. Margie could certainly do with a peek into her auction future! -You need to drink a bit of that. -Shall I let you into a secret? -Swirl it around and tip it into the saucer. That's right. You've got quite a lot gathered around the snake. -Do you see the snake? -That's the symbol of wisdom. -clover, so that's a really powerful sign of good luck. Well, I just jolly well hope you're right, Joyce. he might think Margie's enjoyed an unfair advantage. -Well, thank you. I'm glad. We'd like to give you this witch ball to put up for sale in the auction. and give the witch ball away with it. -How about if I buy you a cup of tea? We'll be taking that out of your budget, though. over to Okehampton in Devon. and even the devil himself have been spotted hereabouts. This is where the pigpen once stood. -Jo, it's good to see you. -I'm Paul. That's right. How goes it? -Jo's shop has a bit of everything. Antiques, collectables and a dollop of retro. And whichever way you rummage, it could take some time. I like a piece that's been buried. Yeah, he likes that sort of thing, too. I love period lighting, full stop. Rather nice little counter weighted lamp. "who cares?" Why does it do that? Could be a railway carriage. Your cruise ship, your passenger ship. As the carriage or car rocked, your lamp stayed upright. Interestingly, the word nausea derives from the Greek for ship. a lot of, it's brass. No-one wants brass in their house because we're lazy. metal of choice in interior furnishings at the moment. -Your brushed aluminium, your chrome and your nickel. Jo? -I like your funky little lamp. -I like my funky little lamp. Out of a railway carriage or a cruise liner? Well, I've got photographs of that identical lamp on the Titanic. but obviously it won't have done. But it's that...that's exactly it. It's that pattern. Precisely that pattern. I'd love to see the book. Oh, dear. Not the Titanic. That'll make it pricey for sure. -I'm looking for £60 for it. -I think he wants to check the facts first. -This is bad news, Jo. but I'm still interested, I don't mind telling you. Perhaps if he finds something to go with it. How sturdy is the steamer chair? Can I sit on it? If I can sit in it, you can sit in it. Famous last words. I like that very much. Now, what's a steamer chair? and it starts to all move, or what? Right, you have got to lift these. Oh, I get it. There's a ratchet at the back. Do you know what I feel? I'll have a little sleep. just six survive? And one of those was sold for £35,000 in 2001. My man will be with me in just a second. But I'll tell you, that...is comfortable, isn't it? for the two is almost £150. He's still on the lookout, though. they were high-quality manufacturers of radio and television equipment. It was an expensive television set, this. It was the Royal Star. Arguably, it's a portable telly. Look at this! a bit of a theme shop. hence the cruise-friendly model name. Time to have a word with the captain. that I like, but I want to haggle hard with you. How about we start at 150? I'll offer you £100 the lot. Obviously, I'm not going to accept that. I think I've got to say 125. 115 and you've definitely got a deal. -I've definitely got a deal, then, haven't I? -With 165 spent, Paul must be almost done. -Can you take me on? Margie, meanwhile, is heading east, to Exeter. is surprisingly free of myth, magic and ancient ball games. been the home of the Met Office. -Hello! Good afternoon, Margie. Pleased to meet you. Norman. Stormin' Norman does have quite a few of his own things for sale. Oh, no - tools. Not coming in there! Ho-ho-ho! Those Imari vases would do nicely, though. The ticket price is £69 and Margie is nowhere near that. It's a good phrase that, innit? -of the antiques dealer, eh? -Quite a handsome pair, aren't they? I don't know what's in the tea leaves, but I'm feeling hopeful. -Ooh. I'd be happy with 40, if you are. I think you'd do well. I'm just nearly there. I'm nearly there. Hey! Norman's just knocked off over a third, Margie. -I'm boring you now, Norman, aren't I? I can see. My indecision is boring you. I think our Margie is girding up her loins to make a cheeky offer. They are not actually a pair, are they? -Oh, they look identical to me. They are a pair, but just a slightly different shape. You can't tip me just a teeny bit more? You are a very persuasive, aren't you, person, yeah? No, it's only cos I'm in such trouble, Norman. -You have the last say. -Thank you very much, Norman. I shall remember you in my will. -the witch's ball on its own. and they get this free! but could I buy a box of matches, please? So, short of buying a lottery ticket, our shopping's complete. But what did they buy? for a cup of tea, making a grand total of £131.70. So, what do Mystic Margie and Predictive Paul foretell? My favourite of Margie's purchases is the buckle. I think he'd be lucky to get £10 for that. Elephants. This is her Achilles heel. Tourist fodder. They're not finely executed, but they are book-ends. The steamer chair is interesting. It's a bit on the edge. He could go down with that. With all hands, eh, Margie? the brakes have been newly settled. Ha! -See the wee geek fossil-hunter in me, when I was a wee boy. -Oh, a place of pilgrimage! opened up Anning's Fossil Depot. Hey! Ah, your auction awaits, ma'am. Welcome to Lyme Bay Auctions. Paul's steamer chair, I'm quite excited about selling that one. That's my favourite of the items. The ball with the box of matches. feel a bit funny when I saw it. on Margie's goods making more money today. Well, that should keep the chaise longue crowd interested. Starting off with Paul's Belle Epoque card tray. -It is my strongest lot. -So, watch this one break even. -and a grown man cry. I have several commission bids on this. Starting at £25. £25, I have with me. 25. 30. 35 and 40. -Still with me, at 40. 45. -That's just break even, though. 55. 60. 65? £60, with me, on commission, at £60. He is still on commission. Come on, bid again! -Whew. That bodes all right, yeah. Spoken like a true seer. Now, what about your lamp with absolutely no provenance, Paul? This one was on the Titanic. -This was on the Titanic. -Why is it not on here? You know, the Trade Descriptions and all that. I have a bid on this. In at £12. £12, I have on the book. 12. 14. 16. 18. 20. 22? £20, I have with me. At 20. 22? 22. Oh, no, not at all. It's a brass lamp. They don't get it. 25, and you're out? 25. 28. to the lady, at £28. -Thank goodness we have got each other. Her elephants might just wipe that smile off, though. -Slightly damaged on one of them, unfortunately. Start me at £12. 14, anywhere? £16, I have. At 16. 18, anywhere? 18. -It's creeping. It's creeping. It's creeping. An even bigger loss, although hardly jumbo. Hoo! I've never done so badly on a Trip. It's all your fault. What do you mean? You're employing dark forces now. You've got witchcraft involved in your battle campaign. Yes, quite. Now, for Margie's nice matches. Apparently, this witch's ball was given as a free gift. that goes wrong in this saleroom. Who will give me a tenner? £10. You are very cruel. 10? Thank you, sir. £10. Someone he knows! £10, I have. At 10. If you get pregnant, it's not my fault. £10, with me. 12? £12, anywhere? I will sell it. Opening bid of £10. -He did a very good job, there. Yeah, and what is even weirder is that Margie has made a profit! Well, I wish him luck. I wish that nice man a lot of luck. Now for Margie's vases. Another profit, please. Got several commission bids on this, just in at £20. £20, surely that's got to fetch a lot more than that. 28. 30. 32. Now in the room at £32. -Yeah, you're all right, it's running. £40 I have, 45 anywhere? 45 anywhere? -45. Thank you, sir. 45, 50. 50. 55? No, £50 at the back now. It's just like the tea leaves foretold. Time for Paul's other tray, the one Margie thought might make £10. -Ooh, I like the ambition, the optimism. -I like that he's trying. -20. It's on you, Colin. £20 I have, at 20. 22 anywhere? 22, 22. Thank you, madam. 25? -He's trying very hard for us. So, a small profit for Paul, which is TRAY, TRAY bon. Let's just hope that Margie's star buy pays off. It's gorgeous. Now, please, let's... let's have a result. I've got a bid on this, in at £30. Now in the room at £55, should fetch more. £55 I have, 60 anywhere? Not off the Titanic but quite comfy, Paul's steamer chair. I'm going to start off at £30. Very nice looking chair, £30 I have. -Oh, straight in at 30. 35. 38. 40. Still with me at £40. Now in the room at £55. I'll take that, that's all right. So, a small profit after auction costs, eh? I've got a commission bid on this, in at £30. -£30 I have straight in. £30 I have with me on the book. 32 anywhere? 32 anywhere? In the room at £32. Lady's bid at 32. Now, do not adjust your sets, you're on telly, Paul. No, I mean your telly's on...telly. I wouldn't have a clue about old televisions. -See the way you say that! -I'm very proud to say that! I've got several bids on the books. Going to start it off at £40. £40 I have with me, 45. 50. 55. In the room at £55. A timeless classic, eh? And a very fine profit, too. So, a good day all round. But Paul has triumphed again. leaving her with £145.44 to spend next time. so he now has £248.62 and a lead of over £100. -What do you mean, not too bad?! It was, like, eight profits out of ten purchases. Eight profits, but you've crept ahead again. Swine. and, best of all, firm friends. 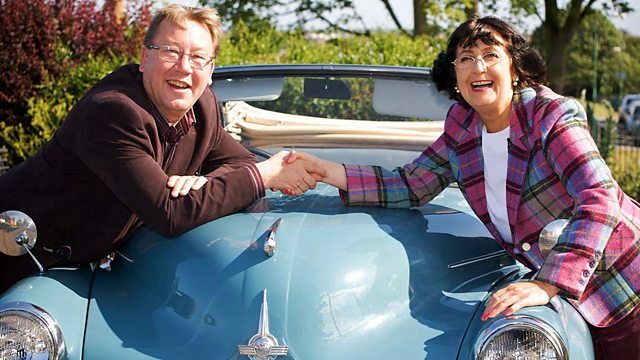 It's the second leg of the road trip for antiques experts Paul Laidlaw and Margie Cooper. After a disheartening first auction, Margie has a lot of catching up to do, but will her fortunes change as the experts head for an auction in Exeter?